That the media dons that control the strings of news broadcasting have double standards while covering certain news is a well-known secret now. That they can be brazen about their acts of omissions and commissions even to the extent of threatening a fellow junior journalist because he stated the obvious, has been brought to light by the recent turn of events. Deservedly, the episode has spread on the social media like wildfire. 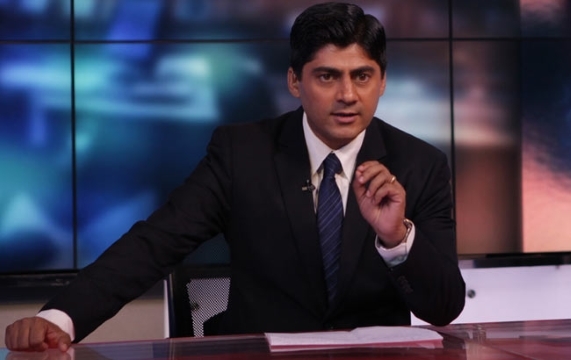 Gaurav Sawant, a young journalist who works at Headlines Today, recently tweeted his disenchantment over the lopsided manner in which news is broadcast. Wondering why the actual updates haven’t been embedded and instead, a screenshot is being used? It is because the actual updates were deleted. Why? It could be anybody’s guess. According to unconfirmed details that have been revealed on social media, Gaurav was forced to remove his updates by the likes of Shekhar Gupta who is the vice chairman of the India Today Group. Gaurav would be sacked, it is being said, if he didn’t remove his tweets. Now, I’m not sure whether this is true or not—whether Shekhar Gupta personally threatened Gaurav Sawant with job loss or not, is not very clear, and it is only appearing as grapevine on Twitter and elsewhere. But the bigger truth is, whatever Gaurav has articulated is accurate. Isn’t it true that the media shows only one side of the story while conveniently pushing under the carpet or sidestepping, or even giving a different spin to the revelations that go contrary to whatever “guidelines” they abide by? Take for instance the recent Saharanpur riots between Sikhs and Muslims. Whereas some print publications revealed the names of the people whose shops and houses were looted and gutted (and hence, their religions also came to be revealed automatically) most of the TV news channels made it a point to show what loss the Muslim residents of the area have incurred. Muslim women were shown crying and bemoaning the loss. They were shown being evacuated by the police personnel to “safer” areas. The Sikhs, despite paying a heavy price for doing something the court has allowed them to do, were shown giving angry statements and complaining about how they were being attacked and how they were being ignored by the administration, and how they were planning to protect themselves. Ultimately, according to the overall coverage, it was Muslims who were bearing the brunt of the entire turmoil and they were the ones who were losing life and property. I’m not saying news of the destruction of Muslims’ houses and properties shouldn’t be covered. But why cover only their losses? Why not also cover the losses of the other community? Haven’t the Sikhs lost their businesses and the savings of their lifetimes? Has any news channel ever shown such footage? Weren’t their loved ones murdered or maimed for life? Why isn’t there even a single debate on the overwhelming hypocrisy of the whole thing? Why aren’t Muslim representatives called and questioned about why they cannot abide by the ruling of the court? It appears as if this community cannot be ever questioned. In another incident a few months ago, a young Muslim IT professional was killed for allegedly posting inflammatory material on Facebook. For the news media, it was not a youth that was killed, it was a Muslim youth killed by “Hindu extremist elements”. There is nothing wrong in saying this, if the religious identity matters so much in the country—a secular country of course. But reverse the tragedy and the religious identity attribution suddenly vanishes. Recently in Bangalore a six-year-old girl was raped by her teacher. Did you ever come across the headline screaming “Muslim teacher rapes six-year-old Hindu child”? I’m using this example because the teacher was in fact a Muslim. But do you come across such headlines? No. But this is exactly what happens when it is to be shown that it is a Muslim who is at the receiving end and it is a Hindu who is the perpetrator, but when a Hindu (or anyone else in conflict with Muslims at that particular time) is at the receiving end and a Muslim is the perpetrator, it is either to be ignored, or to be made religion-neutral. Then it becomes an “act carried out by a person of a certain community”. What happens when you keep on covering the sins of a particular community deliberately, conspiratorially? One obvious outcome is that it breeds a victimhood mentality because at all times, it is being depicted as the aggrieved party. Second, because no one confronts them, because no one questions their conduct and their extreme, even violent actions, because no one tells them that what they are doing is wrong and they are causing harm to other communities, they also develop a deep sense of brazenness regarding how they interact with other communities. And what happens to the other community, let’s say, Hindus? A sense of betrayal, well-placed victimhood and rage begins to manifest. And why not? If you’re constantly being accused of being the aggressor, if you’re constantly being portrayed as a bully despite being one of the most accommodating and peaceful communities in the world, don’t you gradually begin to show the very same traits you are accused of having, while the reality is the exact opposite? This creates a very deep divide and this is why Gaurav said “Secular silence is as dangerous as communal violence”, because by constantly whitewashing the sins of one community you’re sowing seeds of hatred all the time. By constantly portraying one community as a victim and the other community as the aggressor, you are perpetuating a divide that should have been, ideally, vanished by now. This is precisely the reason that incidents like Gaurav Sawant being forced to take down his tweets must be highlighted, must be talked about, must be debated openly, and above all, must be criticised for the dangerous hypocrisy they represent. If Shekhar Gupta actually threatened to sack Gaurav for these tweets, it’s not only his freedom of expression that is being threatened by the very people who are supposed to be the pall bearers of freedom of expression, it is also a manifestation of a very dangerous communal game being played in the guise of secular news reporting. Whether they are doing it purposely or they are just being useful idiots, is an entirely different question. What matters now is the importance of acknowledging the destruction such media activities have wrought in the country. Amrit Hallan provides professional content writing services. He generally mind his own business, but when he strongly feels about particular issues, he likes to take on the mantle of a journalist and commentator.